According to the Norwegian Reindeer Herding Act of 2007 (Lov om reindrift 2007-06-15-40), only those who have the right to a reindeer earmark can conduct reindeer husbandry in the Sámi reindeer herding area. The right to a reindeer earmark requires that the person is a Sámi and themselves, their parents or their grandparents have or had reindeer herding as their primary occupation. In addition, there is a Concession Area in southern Norway, which consists of about 10 000 reindeer, where both Sámi and non-Sámi people are engaged in reindeer herding. 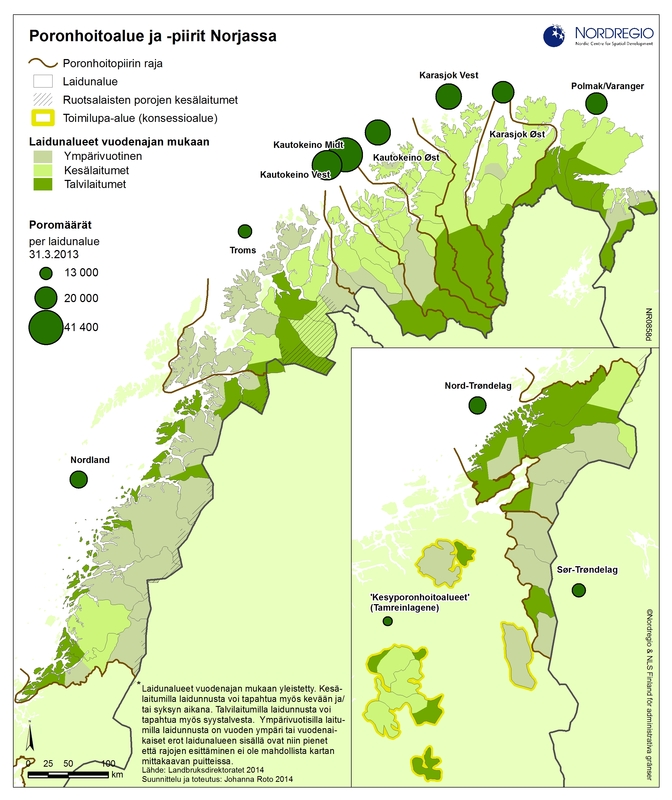 The Sámi reindeer herding area is divided into six regional reindeer herding areas (East-Finnmark, West-Finnmark, Troms, Nordland, Nord-Trøndelag and Sør-Trøndelag/Hedmark) which are then further divided into 89 districts. Some of these districts are inon seasonal use only though most practice an internal division into seasonal pastures, such as spring, summer, autumn and winter grazing. The Concession Area is divided into four semi domesticated reindeer herding districts (tamreinlag).